Playing God has a new price when Helix returns for Season 2 in January 2015. Check out the first footage from Syfy's hit drama. Steven Weber will recur on Syfy's Helix as cult leader Brother Steven, while Matt Long becomes series regular Dr. Kyle Sommer. Production will begin on the 13-episode season later this year, with a winter 2015 premiere slated by the cable network. The actress begins her multi-episode arc as Sutton with tonight's episode, Survivor Zero, debuting at 10 PM ET on Syfy. Dr. Alan Farragut leads a team of scientists investigating a strange viral breakout in a new episode debuting this Friday. Julia freezes up as one of the infected patients breaks loose. The series continues Friday, January 17th on Syfy. A CDC team investigates an outbreak in Antarctica in this Syfy series. Learn more about the show before watching the series premiere on January 10th. From the executive producer of Battlestar Galactica comes this sci-fi thriller. Premiering Friday, January 10 only on Syfy. A group from the Centers for Disease Control travel to the Arctic to research the outbreak of a new disease. Premiering January 10 on Syfy. A highly trained CDC team investigates a devastating new disease. From creator Ron Moore, the series debuts January 10 on SyFy. Watch as creator Ronald D. Moore talks about this upcoming sci-fi drama. Billy Campbell stars as a CDC team leader, debuting January 10th on Syfy. The actress will play Ilaria Corporation CEO Constance Sutton in a multi-episode arc. Ronald D. Moore is executive producing the 13-episode season. The Battlestar Galactica creator has a new sci-fi series coming soon about a team of scientists investigating a deadly viral outbreak in the Arctic. Syfy is debuting this highly-anticipated series in 2014, which centers on a deadly disease outbreak in the Arctic. 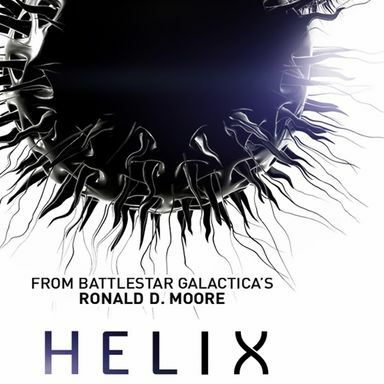 Helix is an intense thriller about a team of scientists from the Centers for Disease Control who travel to a high-tech research facility in the Arctic to investigate a possible disease outbreak, only to find themselves pulled into a terrifying life-and-death struggle that holds the key to mankind’s salvation or total annihilation. Helix begins production early in 2013 to debut early next year. Helix comes from some of the most notable names in the sci-fi world. It is Executive Produced by Ronald D. Moore (Battlestar Galactica), Lynda Obst (Sleepless in Seattle, Contact), and Steven Maeda (Lost, CSI: Miami, The X-Files). Cameron Porsandeh, who wrote the pilot, will serve as Co-Executive Producer.